As individuals and as a community, we benefit from opportunities to receive a quality education and to live in a supportive, enjoyable community. A diverse and vibrant city, Oakland is home to a variety of cultural institutions and activities, creating a more joyful and engaging environment that supports creative expression. 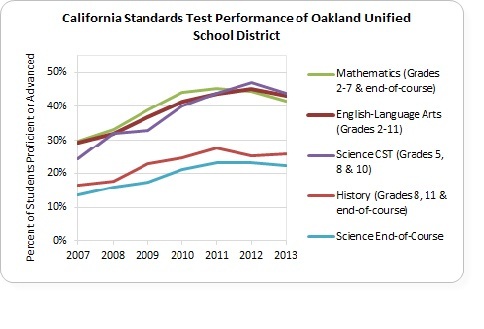 Quality local education opportunities provide Oakland with a ready, capable workforce, and enable our residents to pursue their chosen paths. Public Art Enriches Uptown - The Public Art Program opened Uptown ArtPark, a public outdoor art gallery accessible 24/7. “Repurposed,” the inaugural exhibition, featured large‐scale sculptures made from recycled and found materials. 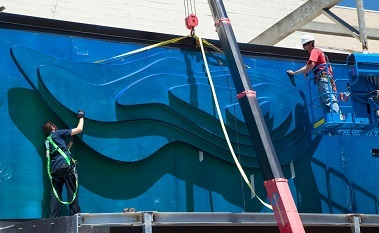 Nearby, installation began on “Shifting Topographies,” a massive wall sculpture with color‐shifting paint that evokes the East Bay hills and the surface of the Bay, brightening an alley entrance to the 19th Street BART station. The City’s Cultural Funding grants supported over 15,000 arts activities that served more than 217,000 residents and visitors city‐wide, including more than 8,000 students in Oakland public schools. Public Works’ Environmental Stewardship Program Builds Community - The City’s Environmental Stewardship Program engages, equips, and mobilizes community volunteers to clean, green, and beautify Oakland and enhance its natural environment. Volunteers lead and participate in community cleanups, annual city‐wide events, and “Adopt a Spot,” an ongoing volunteer stewardship program that includes over 400 “spots.” Volunteers deliver environmental services such as litter cleanup and pollution prevention, storm water management, and wildlife habitat protection, and restoration. Oakland Fund for Children and Youth (OFCY) is Growing - Providing programs spanning the cradle‐to‐career needs of Oakland’s youth, OFCY, or Kids First!, expanded with an $80,000 grant to Oakland Unified School District (OUSD) for the kindergarten readiness Summer Camp program, and a new suite of grants focused on creating safe spaces for an estimated 540 LGBTQ youth. The latter grants include Destiny Arts, La Clinica de la Raza, and Health Initiatives for Youth; these will offer drop‐in space, peer support, educational workshops, and performance art experiences to better connect LGBTQ youth with supportive networks. OFCY’s 126 programs acquired $20 million in outside match funding in 2013‐14, with 60% brought in by the afterschool Youth Law Academy Mixer, Centro Legal de la Raza program partnership with OUSD. Hack the Hood Wins 2014 Google Bay Area Impact Challenge - Hack the Hood is an innovative program that helps Oakland’s small businesses gain online visibility through free Web services provided by local youth. 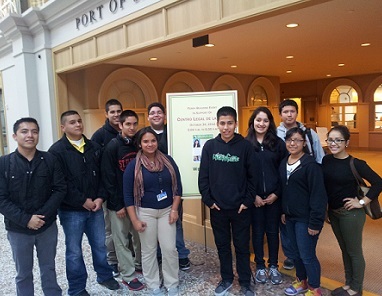 The project is supported by Google, the California Workforce Investment Board, Kids First!, and the Thomas J. Long Foundation, among others. In 2013, 18 youth created websites for 60 local businesses and listed them in Google Maps. Services include mobile‐friendly websites, assessment of business’ Facebook pages, Google Maps and Business Pages listings, and search engine optimization. Participating youth are trained and mentored by professional designers, coders, and developers. Hack the Hood will receive $500,000 as the winner of the Google Bay Area Impact Challenge. OUSD Wellness Champion Program Receives Golden Bell Award from the California School Boards Association - In support of Oakland Unified School District’s Full‐Service Community District, Thriving Students Strategic Plan, the Wellness Champion program identifies school staff members to lead specific health and wellness programs that enhance the overall health of students, families, and staff. The program has initiated school gardens, salad bars, breakfast in the classroom, exercise classes for parents and a variety of other environmental, program, and policy changes in 48 participating schools. Oakland‐Based Foundation Launches Multi‐Year Early Literacy Initiatives for Oakland Children - The Kenneth Rainin Foundation is working in partnership with local community organizations to support early literacy and language experiences, launching two multi‐year initiatives for Oakland children from birth through age 8. The Foundation approved $1.95 million in grants to schools and area nonprofits in 2014 to reduce early disparities in language and literacy development. The initiatives will bring expanded playgroups, increased access to free books, and fun new ways to build reading into the routines of Oakland Families, as well as a new public awareness campaign that encourages family members and caregivers to talk, read, and sing to their babies and toddlers in order to enhance vocabulary acquisition and prepare children for success in school and beyond. Oakland is No. 1 Most Exciting City - Ranked by the real estate blog Movoto, Oakland topped the list of most exciting among the nation’s 50 most populous cities based on 10 criteria: park acreage per person, percent of population between 20 and 34 years old, fast‐food restaurants per square mile (the fewer the better), bars per square mile, big box stores per square mile (the fewer the better), population diversity, movie theaters per square mile, museums per square mile, theater companies per square mile, and music venues per square mile. National Blog Proclaims ‘Oakland Rising’ - On July 9, 2014, Annie Fitzsimmons, Urban Insider author for the National Geographic’s Intelligent Travel blog, posted an article entitled “City to Watch: Oakland Rising.” She wrote, “Oakland is enjoying a moment in the sun… the city’s ascent isn’t fleeting, but one that will have a long tail…” The blog post explores Oakland’s vibrant dining scene, urban wineries, locally-owned retail stores, and great weather. Read the post here. Lowell Park Family Market Farm in the Conceptual Stage - The City’s Office of Parks and Recreation is planning to install a hydrogen‐powered community garden at Lowell Park. Staff have developed conceptual plans and received bids from manufacturers, and are planning to hold more community meetings before the project officially launches.